On March 5, history was made for Kwantlen’s athletic department after two Eagles secured the school’s first national banner. 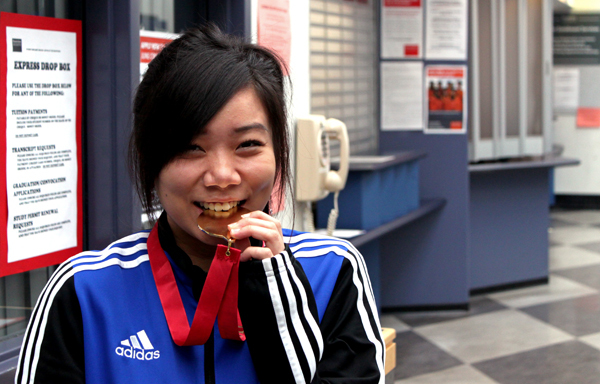 Ashley Jang was half of the mixed doubles badminton team that came back from Sackville, New Brunswick with the gold medal, and she had to go through a lot of pain so Kwantlen could raise their third banner in two years. “Before every match, I spent an hour warming up and re-taping my knee and putting on a lot of lotion and ice. I tried my best to play as hard as I could, but I was really restricted,” Jang said. The second-year biology student hurt her knee during the provincial championships, where Jang and her teammate, Jensen Ly, finished in second place. The national championship took place two weeks after the provincials, and it gave Jang little time to prepare. The injury haunted her for the entire two weeks, and she still had to deal with it in Sackville. “When I would do really fast movements, I would get sharp pains in my knee. I taped my knee really tight so it would be secure in one position,” Jang said. Jang found that her knee was causing her mobility problems, and it led to Kwantlen losing its first match to the pair representing St. Clair College, Johnny Tran and Julie Schell. But after the defeat, Jang decided she wouldn’t let the pain get the best of her. “I was really close to giving up, but after we lost that match, I thought that I would try my best in the next game because I didn’t care anymore. I wanted to win the banner for Kwantlen,” Jang said. The Richmond native and her teammate were set to play their fellow B.C. team in the next match. Jenny Aronson and Bryan Cassels, representing Vancouver Island University, stole the gold from Jang and Ly at the provincials. However, the outcome of this match was different as Kwantlen defeated the BCCAA badminton mixed doubles champions in straight sets. It was at that point when Jang really thought they could go all the way. “After that [win], I was pretty confident that we had a really good chance at winning,” Jang said. The Kwantlen duo won their next four games to set up the championship final against the tournament favourites from the Northern Alberta Institute of Technology, Sinead Cheah and Joey Vandervet. The Eagles pair beat NAIT in straight sets, and won the last set by a nine-point margin.